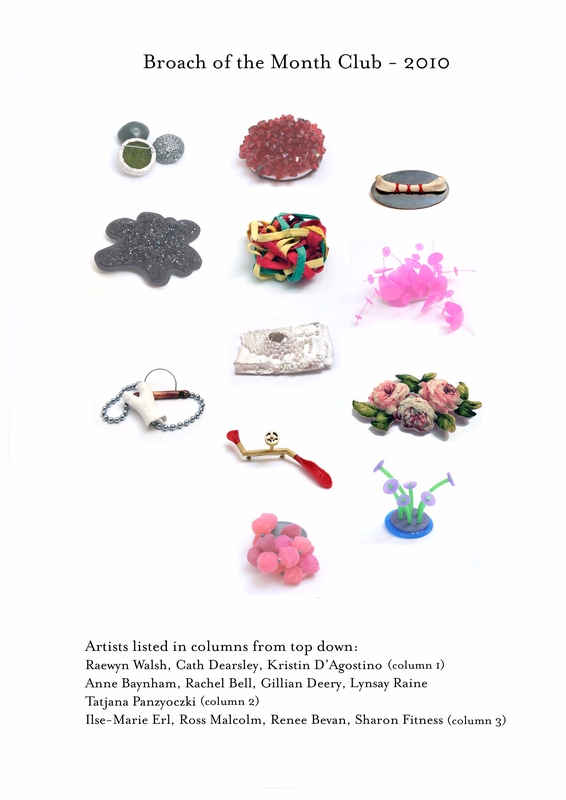 In March 2010, Masterworks Gallery exhibited a retrospective of the “Broach of the Month Club”, a collaborative year-long project between 12 makers, 12 wearers and 12 Brooches in 2008/2009. The Broach of the Month Club 2008/2009 was created to reinstate the community aspect of traditional craft into contemporary jewellery culture. It focuses on the emotional and physical experience of wearing. Twelve emerging jewellers each submitted a brooch reflecting their unique attitude or mode of approaching jewellery. Each brooch had its own travelling box, and short blurb about the jeweller and the brooch. Meanwhile, twelve “care takers/wearers” were recruited to wear, reflect and swap brooches in a book club format. Masterworks has decided to partner with Broach of the Month Club for the 2010 season, including six original BOM makers, six Masterworks makers and twelve regular Masterworks clients and friends of the Gallery.